I’ll never get tired of watching lunar eclipses. Even though I understand the science of what’s occurring, there’s still something magical and mystical about the event. 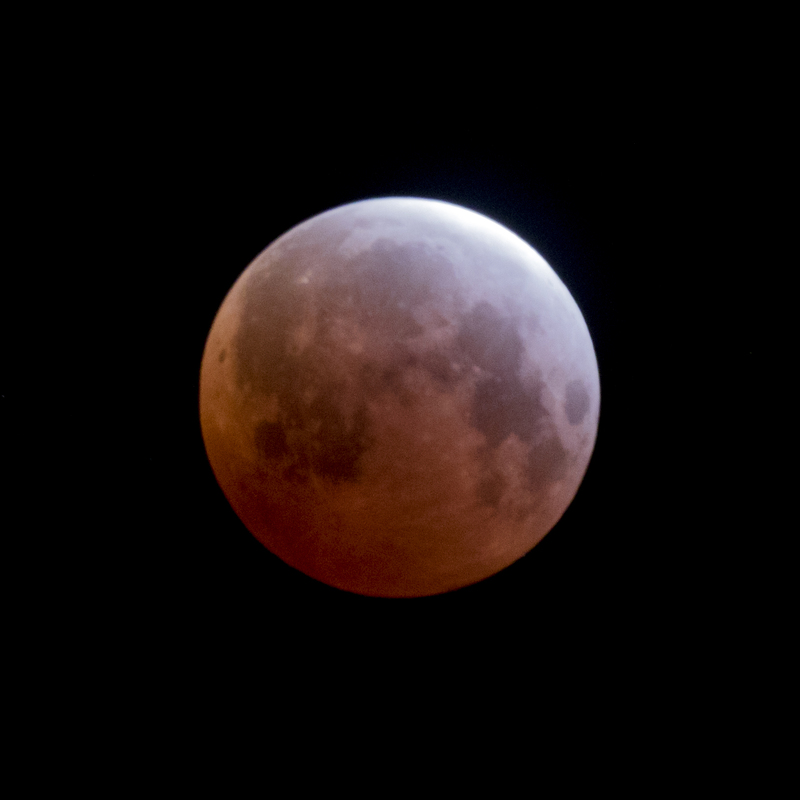 This morning’s eclipse peaked exactly at 5:00 AM in the San Francisco Bay Area. This image shows the darkest point of the eclipse. There was still a sliver of light on the upper right edge of the moon that never disappeared completely. I think folks in western Alaska and Hawai’i were treated to “true” totality…but we got the next best thing! No complaints from this photographer. Now if you’ll excuse me, I could use a nap! What flower do you most associate with Spring? Crocuses, daffodils, poppies? It probably depends where you live, or where you grew up. 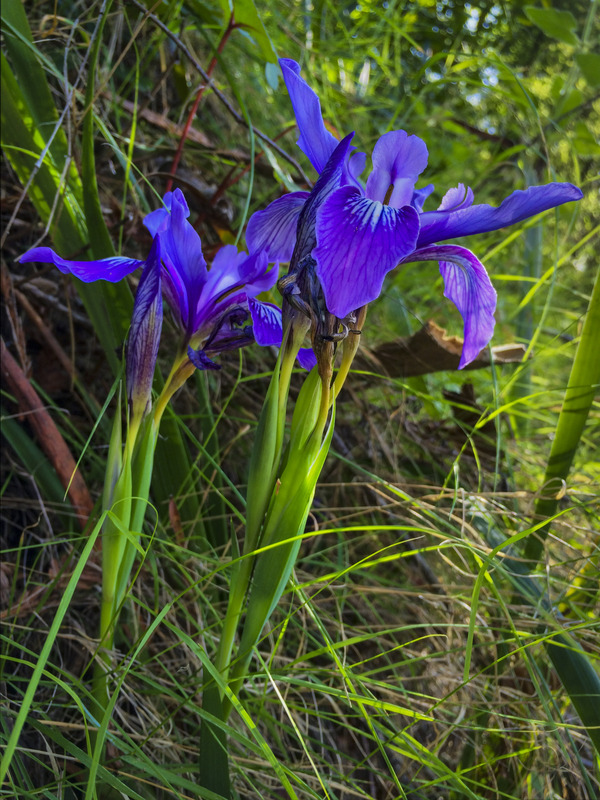 For me, a native Californian, nothing say “Spring” like the Douglas Iris (Iris douglasiana). It usually grows under a foot tall, but it packs a lot of beauty, especially when you find a large clump of them blooming together. Its dark green leaves and deep purple flowers are a dramatic combo. Happy Spring to all my northern hemisphere readers (and happy Fall to all of you on the southern half of our planet)! 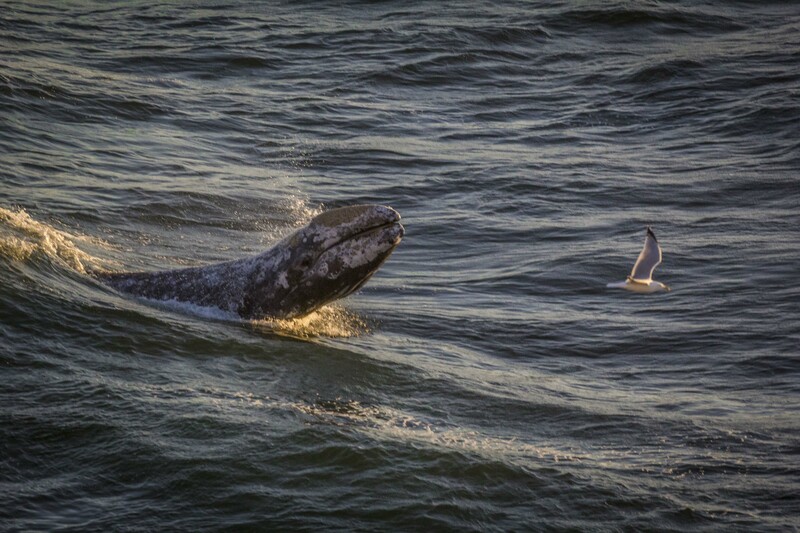 Identifying wildlife can sometimes be challenging when you can see the entire animal, but that rarely happens when whale-watching, unless you’re lucky enough to witness a breach. Most of the time, you’re probably looking at less than 5% of the whale at a time as it swims below the surface. One identifying characteristic is the blowhole. Did you know that toothed whales (e.g. sperm whales) have a single blowhole, while baleen whales (e.g., grey whales) have a double? 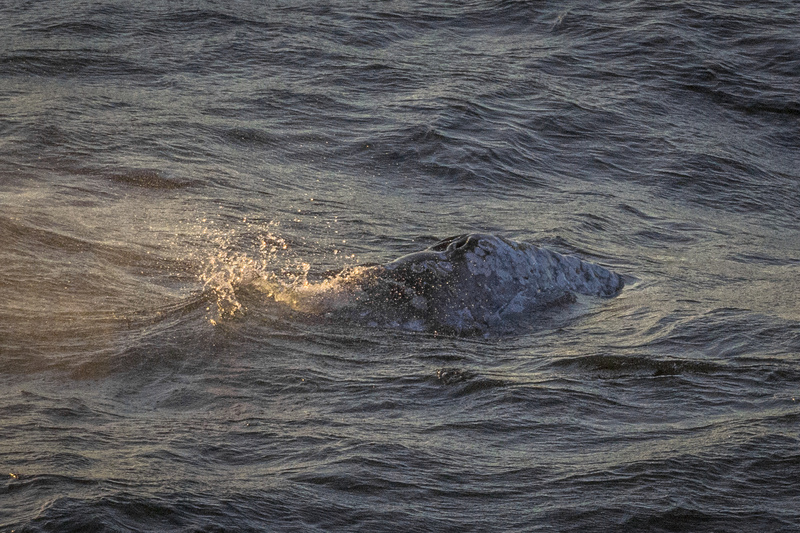 In the above image, you can clearly see the double blowhole, which helps to identify this as a grey whale. 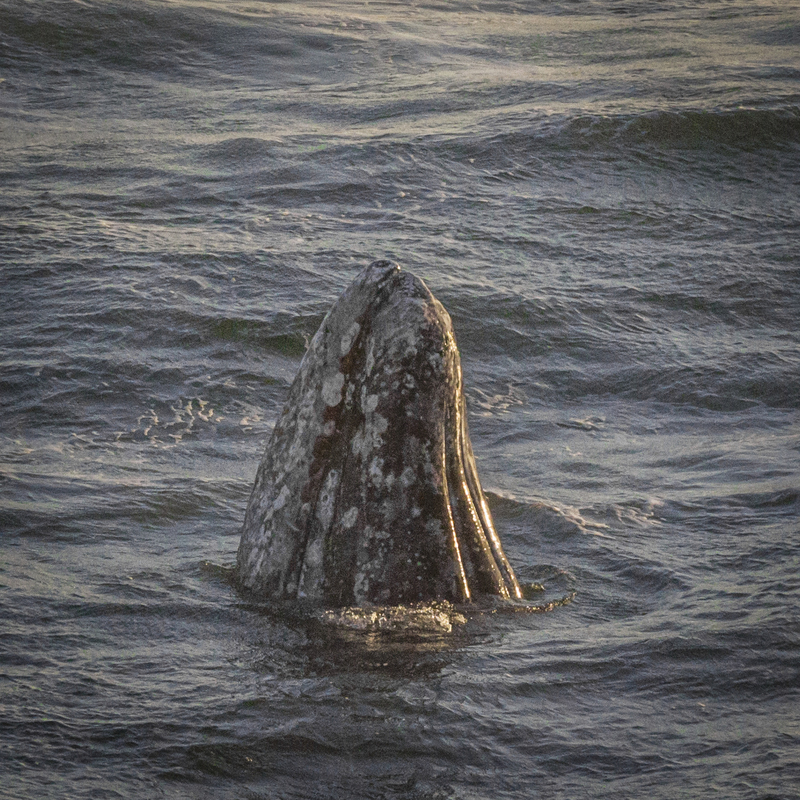 As I watched this grey whale calf play in a cove yesterday evening, I got the feeling that it was practicing its moves. For example, in yesterday’s post (“Watch the Birdie,” 03.17.15) the whale is lunging out of the water, and I watched it do this several times, but it never did a full-on breech. Likewise, I watched it spyhop several times, but it never came up out of the water far enough to actually look over the surface of the ocean. It came up very, very slowly–over perhaps 10 seconds, to the height in the image above, hovered there for about five seconds, and then very, very slowly sank straight down again. It really seemed to me that the calf was trying out these new maneuvers, and they weren’t yet second nature to it. I imagine there’s a learning curve to whale ballet, and while the adults seem to perform it quite effortlessly, maybe the young ones’ muscles aren’t developed enough, and/or their coordination is still lacking. If you’re reading this and you know more about whale behavior than I do, I welcome your comments. I still have much to learn. In the meantime, I’ll continue to shameless anthropomorphize until someone sets me straight! 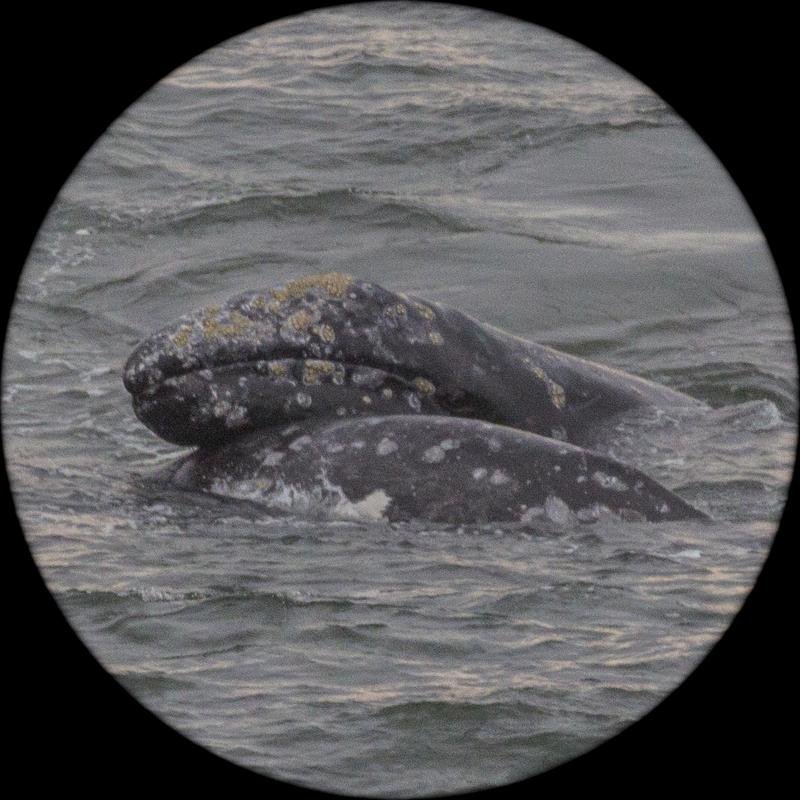 How else are you going to get a grey whale calf to smile for its portrait? I watched this calf play in a cove for about an hour this evening. There was no sign of mom, though I’m sure she was in the vicinity. The calf made several leaps out of the water, and also practiced spyhopping. It put on quite a show. 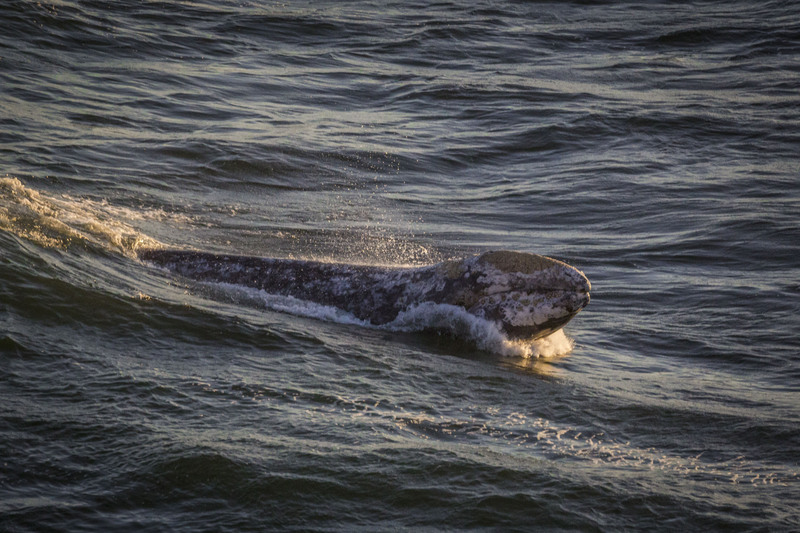 The grey whales are migrating just off the coast of California right now. The moms are heading north with their calves, and they come much closer to shore on their way north than when they’re heading south to give birth in the lagoons on the west coast of Baja. The calf is resting on its mother’s back. This scene reminded me of taking a walk with a toddler: they’ll run circles around their parents, then insist on being carried! I took this image this evening about an hour before sunset, from land. Yes, they were THAT close: inside the surf zone. Unfortunately, heavy overcast didn’t make for the best light, so the image is soft…but too sweet to not share. While it may appear at first glance that this beautiful young Himba woman was posing for this portrait, that wasn’t the case at all. In reality, she was busy grinding maize in her hut, and I caught her in between strokes! 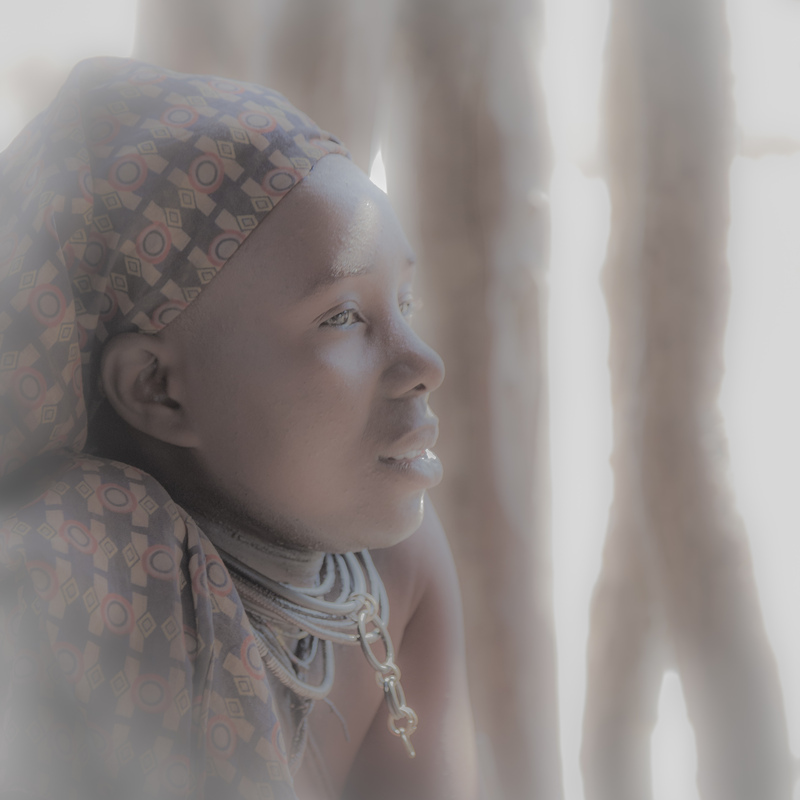 A young Himba mother and her infant share a quiet moment in the shade of a hut. I love the serene expression on the mother’s face, and the sweet gesture of the baby’s hands and arms. It reminds me of the classic “Madonna and child” paintings. 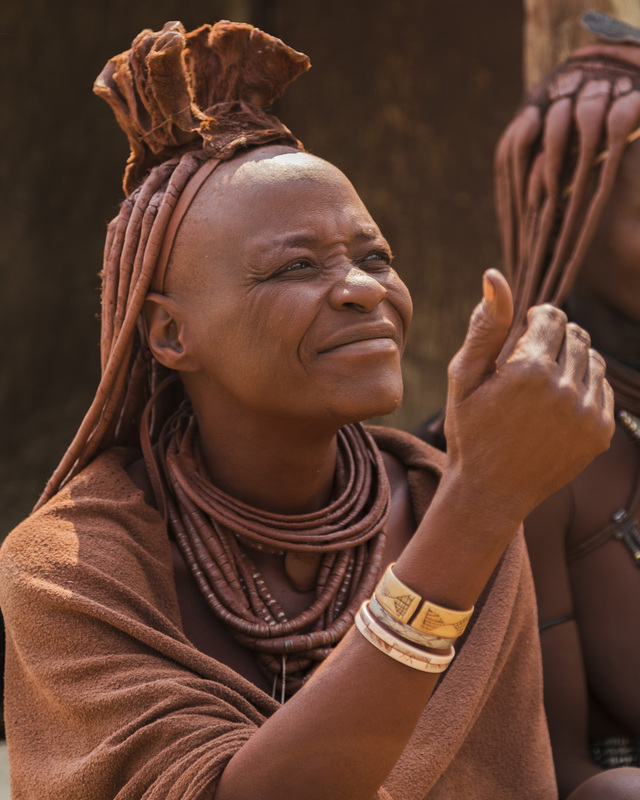 If you visit a Himba village in Namibia, your visit will likely begin with your guide introducing you to the Chief, or if the Chief isn’t available, to the Chief’s wife. The guide explains that we have brought gifts, and asks permission of the Powers-That-Be for us to enter the village. “Gifts” include staples like corn or maize flour, and relative luxuries like tobacco. While I personally am not a fan of the killer weed, it’s evidently a good door-opener in this part of the world. People like me, child-free by choice, were met with a mixture of confusion and pity. In the Namibian culture, it’s very important for the married women to bear children, and for the men to sire a number of offspring with their wife (or wives). When those of us who didn’t have children admitted it, it was assumed that we couldn’t have children, for health reasons, poverty, bad luck or the anger of the gods or ancestors. All of this was translated via our guide, as the Himba we visited spoke no English, and we didn’t speak their language either. Despite our infertility, we were with met with good cheer, and perhaps more compassion than we deserved. Our small group was granted permission to roam the village and photograph the residents. 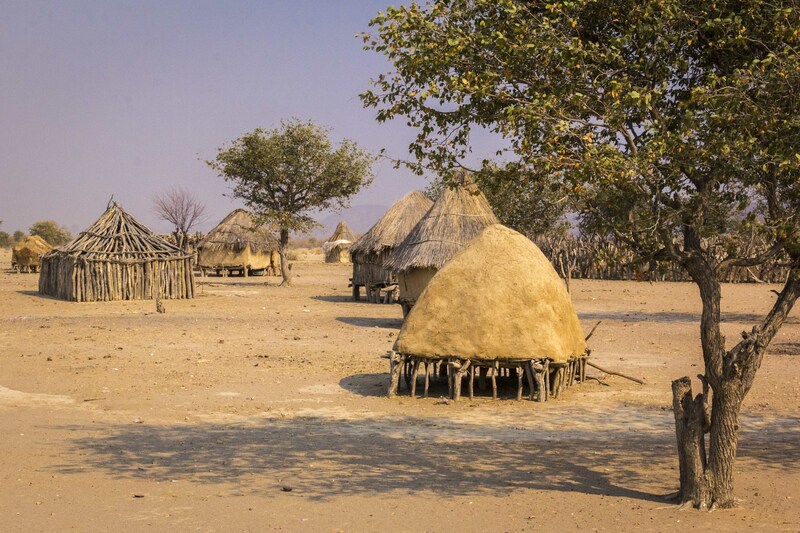 These are some examples of the different styles of huts found in a Himba village in Namibia. Wood is scarce in this region, so many of the huts have walls made of a clay and manure mixture, and thatched roofs. All of the huts I entered had dirt floors. The villagers I met both sat and slept on the floors of their huts. The nice thing about the small huts–for me–was that I could be close to my subjects. Many Himba villages are not permanent: when the distance from the village to their livestock grazing area becomes too great, the entire village gets moved!